Home should be a place where you go at the end of the day to kick your feet up and feel comfortable: you should not have to come home just to find to mold on the walls. If you find mold growing in your home call a mold removal experts, The Best Restoration of Gainesville, FL. In addition to the adverse health effects that mold can have on the respiratory system, mold is simply an unsightly invader in your house. And if you have children running through the house, the last thing you want is to leave mold deposits growing rampantly throughout your home as mold can elicit lasting impacts on children’s health if the mold is not properly taken care of. It is imperative for your family and health sakes to seek the help of a mold removal experts. The most severe cases of mold are usually caused by flooding or a severe weather storm that causes leaking in the home. But, mold proliferation can also be caused by normal, everyday activities, such as taking a shower and not letting the bathroom dry out. 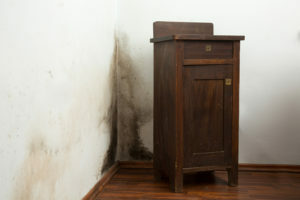 Any sort of water leak or standing water source can create a moist environment that is perfect for mold to thrive in, so the first step to mitigating the possibility of having mold in your home is to make sure that there is no standing water left around and that your plumbing is not rusted or damaged. If you own an older home that has not been maintained well or that has been vacant for a number of years, you are going to want to look into having some mold remediation completed on the house because vacant homes provide the perfect conditions for mold to grow: it is a closed environment that traps humidity and warmth. You will often find mold growing under the carpet, in the walls, and in closed in locations/tight spaces such as behind a radiator or in a water heater closet. Plumbing leaks are guaranteed to breed mold if they are not taken care of properly and in a timely manner because plumbing leaks provide moisture in areas of your home that are typically not well ventilated to begin with. Ventilation is important because it keeps moisture from remaining stagnant and generating conditions for mold to grow over time; this in combination with a plumbing leak can mean bad news. As stated before, the most common cause for extreme mold conditions are elicited when flooding occurs and the walls, floors, and vents become completely inundated with water. Also, if there is a leak in the roof and a severe weather event occurs, allowing outside rain to cause water damage to the interior of a house, mold can proliferate quickly. Again, humidity is a huge factor when it comes to mold growing in a house. So if you live in a humid area, the best thing you can do is to make sure that your home is well ventilated, especially areas such as the basement and the attic wherein it is easy for humidity to get trapped and wherein the sun hardly shines. So before your mold issue gets out of hand, assess the situation and consider hiring a Gainesville professional mold remediation service.